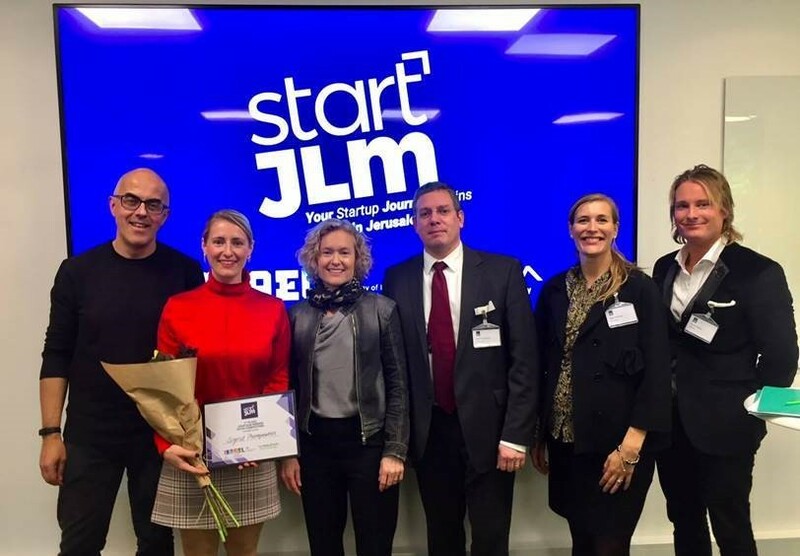 On October 19th, Sigrid Therapeutics AB (Sigrid) won the Start Jerusalem (JLM) pitch competition organized by the Embassy of Israel in Stockholm in association with the Sweden-Israel Chamber of Commerce and Sweden’s innovation agency Vinnova. The selected companies were judged by a jury drawn from Norrsken Foundation, Schibsted Growth, Industrifonden, Vinnova and the Israeli Ministry of Industry, Trade & Labor. Sigrid Co-founder & CEO Sana Alajmovic pitched in competition with selected Swedish biotech, medtech and eHealth startups. The presentation was judged on the basis of social impact, scalability and technological readiness level. “I am pleased to be recognized by such a distinguished jury that appreciated the global potential of our platform technology and our lead product candidate SiPore15TM. I am grateful to the organizers for the opportunity to pitch Sigrid and look forward to presenting our product and technology to the dynamic startup and investment community in Israel”, said Ms. Alajmovic. Start JLM brings together innovative, early-stage startup founders from around the globe to explore and experience Jerusalem’s startup ecosystem. The winner of the Swedish Start JLM 2018 will join winners from all over the world during November 11-17 to take part in a 7-day immersive program, featuring interactive fireside chats and panels, specially designed how-to workshops, site visits at leading companies and exclusive networking meet-ups with the city’s start-up community. The winners will also present their ideas to high-ranking investors in Israel. Sigrid Therapeutics AB (Sigrid) is a Swedish clinical-stage biotechnology company whose lead product candidate is SiPore15TM, a precisely engineered, orally ingested material acting locally in the gut. The material is protected by filed IP and produced to cGMP standards. SiPore15TM is under development as a first-in-class medical device targeting prediabetics and newly diagnosed type two diabetics. First in Man data indicates that SiPore15TM has a favorable safety profile and significant effects on blood sugar, blood lipids and body fat composition. SiPore15TM is the lead product candidate based on Sigrid’s proprietary platform technology SiPoreTM. Solutions based on SiPoreTM have the potential to become breakthrough therapies for a range of preventable metabolic disorders and diseases with high unmet clinical need.